Altec Lansing has announced a meaningful update to last year's Life Jacket speaker, which was pretty cool in its own right. This year's version is called the BoomJacket, which boasts double the battery life of its predecessor along with increased connectivity range. It can also be used as a portable charger for your other devices, though we don't have any specs on that just yet. Take a look at some of the stuff Altec Lansing did to the Life Jacket, which is now the older model. Explosives, trucks, water, sand, dirt, etc. are no match for it. The BoomJacket, which is 7.5" x 3.125" x 2.825" in size, has two 2" neodymium drivers and passive radiators (downsized from the Life Jacket's 2.5" drivers) while supporting aptX audio output. There are a lot of pricey, non-rugged speakers out there that only have one, small driver; Altec Lansing didn't skimp on the audio side with this product. The Bluetooth connectivity range is claimed to be 50 feet, which is on the high side of the usual amount in competing speakers. It can remember up to 8 devices at once in addition to having the ability to play through 3.5mm auxiliary input. Android devices, in addition to iOS and Blackberry, can take and reject calls with the BoomJacket as well. 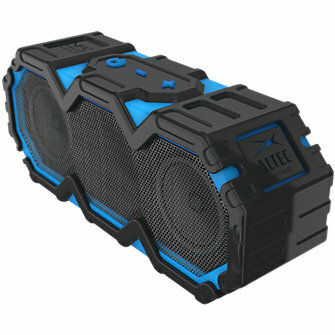 This is done, Altec Lansing says, with voice commands, which is pretty nifty. Still, this speaker is all about the all-weather, all-uses capability. 40 hours is a ton of playback time, while the average competitor is often less than 10. That battery life is even better when considering the BoomJacket should be resilient to whatever kinds of mayhem you throw at it. The BoomJacket will retail for $199 and will ship in spring 2015. We'll update when Altec Lansing provides us with some photos, too.